Have you heared about lolifox? …or maybe you already have it | Moe fever... is it good? Moe fever… is it good? lolifox is another Mozilla-based multi tab internet browser based on Mozilla 2.0. this lolifox will function as like others web browser but has advantages in browsing. it will offer extra features where cannot be find in normal firefox and it comes with own predefined bookmark. usually it will be blank at this tab but by lolifox, which are also shown on the bookmarks toolbar. Those are the lolifox home page (temporarily closed till the next version comes out), latest headlines feeds, anime torrent sites feeds, and links to Hongfire, DaTorrents and BoxTorrents, AniDB, ANN and AnimeNFO and Antenna, a blog about anime. 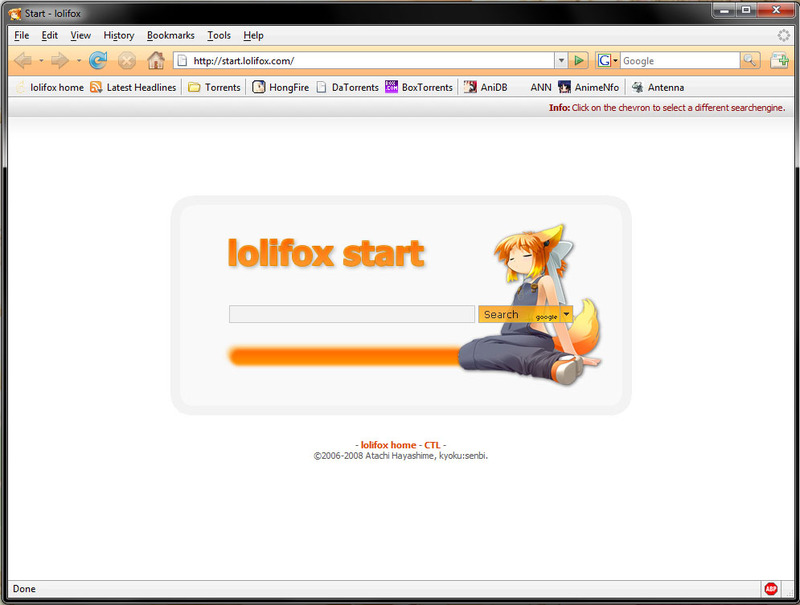 this lolifox default starting page is http://start.lolifox.com/ where offer 7 search engine which can be select by clicking arrow button beside search button. that’s search engine include google, yahoo, MSN, also anime site like Animesuki, Tokyo Toshokan, HongFire and DaTorrent. 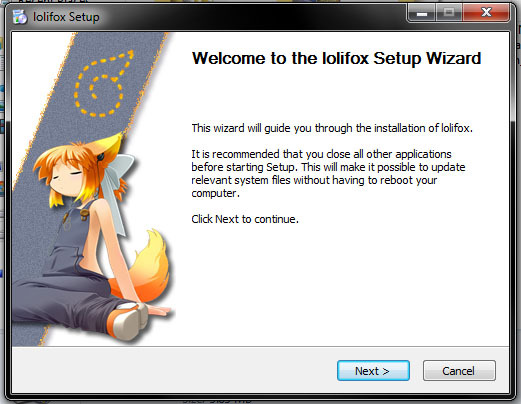 Beside of loli fox figure inside main page, lolifox also will offer feature that present in firefox 2.0 and additional of anime link but that only 2.0, not as latest as firefox 3.xxxx or higher (in future) right now. hope the notice of closing till next version comes out will be true… I mean until some period of time, they will release new version of lolifox. I’m really loving the theme/design of your website. Do you ever run into any web browser compatibility issues? A small number of my blog readers have complained about my blog not operating correctly in Explorer but looks great in Safari. Do you have any suggestions to help fix this problem? Wonderful goods from you, man. I’ve understand your stuff previous to and you’re just extremely magnificent. I really like what you’ve acquired here, really like what you’re stating and the way in which you say it. You make it entertaining and you still care for to keep it sensible. I can not wait to read far more from you. This is actually a wonderful website. Nice post. I was checking continuously this weblog and I am impressed! Very useful information specially the final section :) I maintain such information a lot. I was looking for this particular information for a very long time}. Thank you and best of luck. Good Job Club (GJ-bu) – Kirara Bernstein… is she (possibility) my new crush after Konoe Subaru? Minami-ke Tadaima – Spring is here, also the Minami’s!! Kore wa Zombie Desu ka - Of the Dead - 01 - 'pervert' without eraser?